$1/4 Del Monte Fruit & Vegetable Coupon! Hurry on this one! 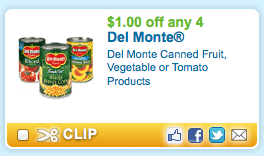 Hurry over to Coupons.com to print out this $1/4 Del Monte canned fruit, vegetable or tomato coupon. This is a great coupon to have when they go on sale!